Let's get about the business of Dreaming Better. theJobSpectrum™ is an attempt to use the Laws of Nature, common sense and democratic principles to Dream a Better Dream for this particular reality. Start small, grow sensibly and be a healthy, profitable endeavor for any that wish to Participate. 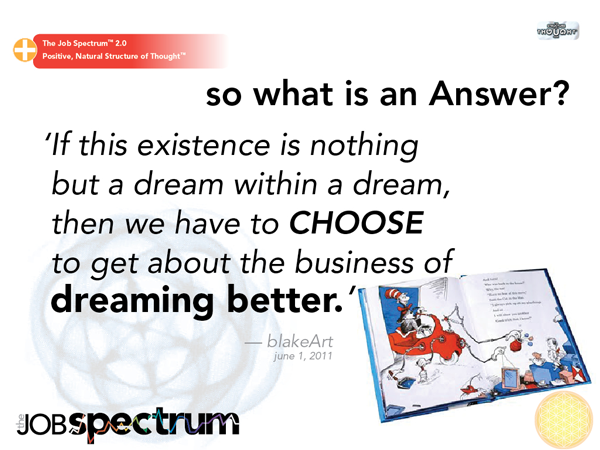 How theJobSpectrum™ will succeed. Scalable to be any size because of its spiral structure and business model, the JobSpectrum™ is self-sustaining, Shared-Labor, Shared-Revenue Survey Mechanism. Because it is designed using the Ancient Laws of mathematics, the language of Nature, it will work even in its beginning stages, and it will spiral its growth and be functional at any size. • Ranking of everything has become a standard part of everything on the Web—Buzzfeed, Digg, Gawker, Klout, and what Google rank web pages for relevance. • Filling out theJobSpectrum™ creates a captive audience – another great opportunity for Advertisers’ platform – and with the large majority of that adspend going to the Participants themselves, which is the first AdRevenue Sharing Platform. • Brand Loyalty is and always will be a key factor. Knowing that the ad revenue contributed to theJobSpectrum™ and is going directly into the Participant’s pockets – this will enhance the brand awareness 10X what it would do seeing the ad on any other site. This translates into more bang for the advertising dollar. • In turn, the Mechanism of theJobSpectrum™ dictates where the Unique Ad Revenue sharing goes, governed by how the Monthly Participants score the Guilds at that time. This not only gives people something to combat the fact that Jobs are going away, giving them something to do, but also puts the control of the Revenue Stream of Money itself into their hands. • This revenue stream lubricates the Mechanism and creates a steady, healthy flow of revenue to all Participants, regulated by the Laws of Nature and Governed by the Monthly Results of the Survey itself.